Application Insights | The IT Melting Pot! 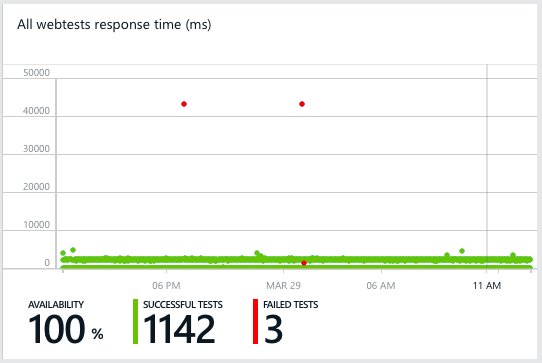 But this is a really cool capability that I think that many of you will like, how often do your company or service provider have a good way of monitoring availability, performance etc. from the public Internet? And if they do then most of the time the larger service providers will build a service and install their own probes on different geographical locations and then they charge quite a lot for this service, and every time you change your application the charge you again for modifying the scripts that the probes use etc. What I’ve tried and now think is going to be great for both smaller and larger organisations is the Azure Application Insights service. It’s really great and can assist with just this, it’s a service that microsoft provide from their locations globally where you can test your apps in Azure or course but also any web site out there on the Internet. And it doesn’t stop there, you can also use the server installer to also provide metrics from your Windows IIS server up to Azure to get more detailed statistics about the web server itself and requests etc. 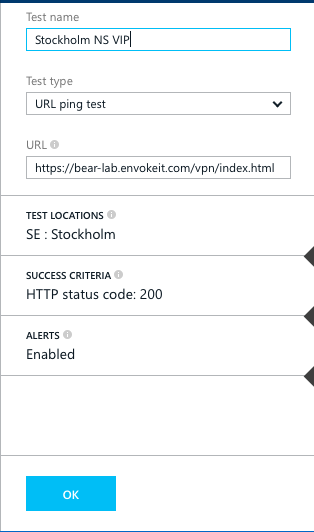 And this is just a simple url ping test to ensure that we get a proper 200 OK response from our EnvokeIT Lab environment that my colleague Björn have setup and modified so nicely with the X1 StoreFront look & feel. Of course you can make a more proper test than just a url ping test like in this case, the service supports multi-step tests and also content matching etc. It’s also very easy to create one application/service that then consists of multiple locations that you want to monitor, for instance if you’re using GSLB FQDNs as well as regional to ensure that you get the full picture.